A few years have passed since my visit to Argentina. I had a great deal of fun sharing my talents with Buenos Aires’ lovely Hare Krishna devotees. Here’s day #1 at Buenos Aires’ prestigious Instituto Argentino de Gastronomia., where we introduced the chefs there to some pretty exciting vegetarian dishes. We’re rolling gulab jamuns, by the way. I ‘did my bit’ by helping to introduce a good number of portenos to the glories of vegetarian cuisine. 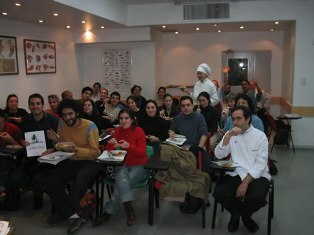 Below is day #2 at the Instituto, with some of the trainee chefs enjoying lunch after the class. Why am I telling you this now, you ask? 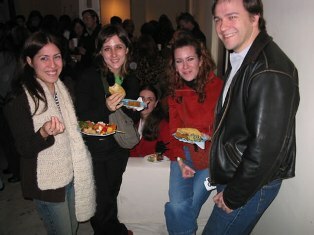 “BUENOS AIRES – Although the term “cocina vegetariana,” or vegetarian cuisine, tends to draw blank stares or outright pity from Argentines on the streets of this city – considered by many the red meat capital of the world – vegetarians need not write Buenos Aires off as a travel destination.